Are you a woman who sometimes struggles with self-doubt, even though you may be successful in business, be a brilliant friend, an amazing mother who looks after her children and everyone else for that matter? Do you sometimes question your own abilities and wonder whether you are good enough in certain situations? Do you find yourself feeling overwhelmed at times, trying to juggle work, children, errands, social activities etc. Do you sometimes wish you felt more confident so that you could grab opportunities when they are presented to you – or even better – get out there and create those opportunities? It is very common for women to experience that niggle of self-doubt creeping into their minds. Women in general, frequently underestimate their abilities. Men – in general – seem to be far better and more comfortable at ‘blowing their own trumpets’ – so to speak – than us females. This can apply to whether you want to push yourself towards a job promotion, actively seek more clients, be in a situation where you have to promote yourself, or ask for something that you want. There are some factors at play here. From the time we are born, girls are taught to be the nurturers, the carers, the givers. So why do so many women feel so uncomfortable in asserting their wants or needs? There are usually limiting beliefs that are the crux of it. The language used is self-depreciating, negative and doubtful. What this internal dialogue does is enable the woman to create a story in her mind as to why she can’t do something or why she shouldn’t do it. These stories then validate her reasons and then she finds herself avoiding a situation or an opportunity because of these limiting thoughts. Hey presto, she has an excuse not to do something now because of the stories she has created in her mind. The irony is that to our friends, us women are typically very nurturing and supportive and if we had a friend who was saying all those things to herself, we would quickly jump to her aid to support and encourage her. If only our internal dialogue was that supportive at times! 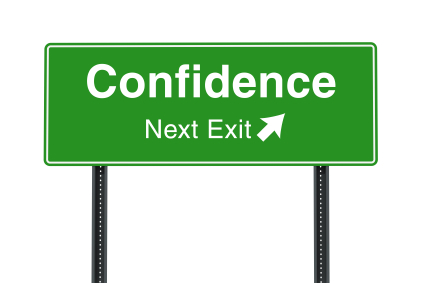 Confidence is typically learned – or not – in childhood. Often, all it takes is for a 5 year old to hear a comment perhaps from a parent, sibling, friend or teacher such as, “Oh you haven’t done this properly!” – which in some instances, that child can take that comment on board and to heart and suffer from self-doubt in adult life. Here are some tips which can help. Become aware of the type of thoughts you have on a daily basis. Write any self-limiting thoughts down. Then ask yourself, ‘Is this thought or belief true? How do you know it’s true? What happens when it’s not true and no longer true for you? What happened when you stopped believing that old thought? What did you do instead? Look at yourself in the mirror. I’d like you to say out loud whilst looking at yourself in the mirror “I can, I can, I can, I can!” Look yourself in the eye and say it. Say it out loud ten times. Each time you say it, say it LOUDER! Next time you walk into a business meeting, networking event, presentation or anywhere else where you want to feel more confident, take note of your posture. Stand tall, shoulders back, stomach in, chest out. Imagine there is a string pulling you all the way up from your feet all the way to the top of your head. Even just changing your posture can help you change how you feel. Focus on what you want. And never on what you don’t want. If I were to say to you, “don’t think of a purple frog!” what do you think would happen? You most likely would think of a purple frog! Your unconscious mind cannot tell the difference between what is real and what is imagined. Hence, if you are thinking negative scenarios, you will feel all the negative emotion associated with that imagined scenario because your unconscious will think it’s real! So, imagine what would happen when you really focus on what you want instead and make a point of making that a daily habit? Your life would change! Notice your breathing. As adults, our breathing can often get shallower and more rapid. This usually happens at time of stress. Remember to take slow, deep breaths through your nose and exhale slowly through your mouth. Even if you were to do this for 5 minutes a day, you would notice a difference. Notice and observe any thoughts you have without being attached to them. Write down in which way you think you are unwittingly sabotaging yourself. Anything that you think is stopping you from making progress. It often helps to write thoughts down. Once you’ve written down your negativity list, then put it in the bin. Write down what you can do differently, starting from today. Profound change starts from the very first baby step. If you would like to chat or see if I can help you in any way, then please drop me a line.